I’ll admit that there’s a definite European bias to my mythology posts. A lot of it is Greek, which is really the mythology that a lot of us, at least in my neck of the woods, know best. I do try to include mythology from other parts of the world when I think of it, but I’ve largely neglected the continent of Australia. The one thing everyone knows about aboriginal Australian mythology is its emphasis on the Dreamtime, but it’s not entirely clear from its name what that actually is. From what I’ve read, the Dreamtime is basically the time when the spiritual world was at its height, and the world was created. Also, a lot of the earliest inhabitants of the world were sort of humans and animals at the same time. Although the impression given is that the Dreamtime was in the distant past, it’s still possible to communicate with it in various ways. 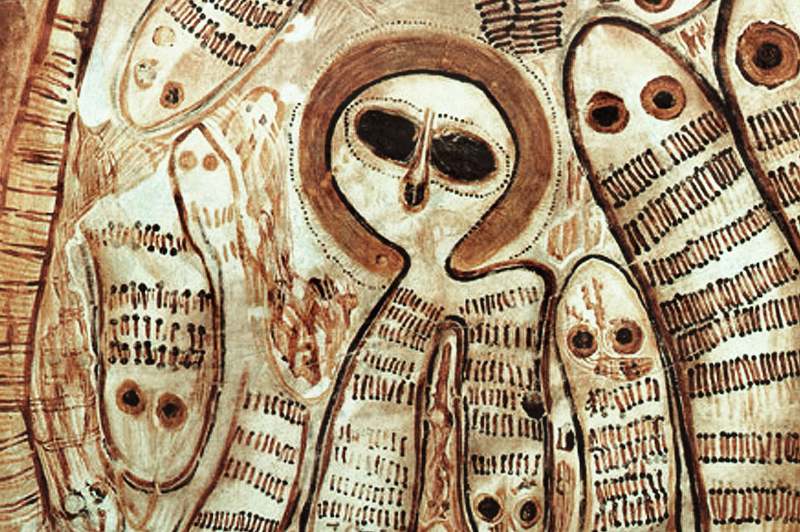 One particular bit of aboriginal mythology that I came across involves the Wandjina, water spirits existing in the beliefs of the Mowanjum tribes. Sometimes it’s spelled “Wondjina,” but either way I don’t know how to pronounce it. Led by Walaganda, these spirits came to Earth from the Milky Way, and were in charge of creating the land and its people. Walaganda eventually returned to the Milky Way, but many of them remained in Australia, and turned themselves into paintings on rocks. They’re depicted without mouths, but it appears that some legends say they did once have them. They created a flood similar to Noah’s, which drowned most of humanity. After this, they no longer had mouths, because that would result in the world being flooded again. Even though they’re now in painting form, they still have the power to create storms. The Mowanjum people still touch up the Wandjina paintings, but only specially sanctioned artists are allowed to do so. This entry was posted in Australian, Mythology and tagged dreamtime, mowanjum, walaganda, wandjina, wondjina. Bookmark the permalink.